Lamarr Smith (born June 18, 1987), better known by his stage name O.T Genasis, is an American rapper who grew up in Long Beach, California. He is currently signed with Conglomerate Records. 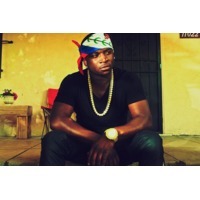 G-Unit Records signed him in 2011, and in 2012 he released his debut mixtape, Black Belt. His most popular singles include "CoCo", "Touchdown" and "Jackie Chan". He performed in a cypher at the 2014 BET Hip Hop Awards with Kevin Gates, G-Eazy and Loaded Lux. He was featured on Busta Rhymes's 2014 mix tape Catastrophic 2. His first major-label debut album is expected to be released in 2015. "CoCo" peaked at number 20 on the Billboard Hot 100.